It’s hard to talk about the Ellijay Coffeehouse without first meeting Rick Lucas and JoAnn Antonelli this dynamic duo has been a team since 2005 when they met…fell in love and began their extraordinary journey. JoAnn is a lifelong serial entrepreneur her history has revolved around being an artist, designer, merchandiser, small business consultant, gardener, numerous start-ups …she is a creator of extraordinary ideas. 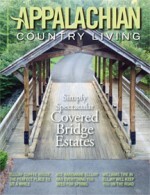 In 2007 they bought an 18-acre homestead just 2 miles from the Coffeehouse located in historic downtown Ellijay, which became known as ‘The Martyn House’ The plan for this beautiful and remote sanctuary surrounded by lush nature and saturated with eclectic charm was to create a transformative experience. They wanted guests to connect with the earth and its natural food sources so they began by hosting farm-to-table dinners. Their vision included the vibrant local art community which included artist studio tours and retreats. The Martyn House quickly became Rick and JoAnn’s passion; a physical manifestation of their ever-evolving creative energy. Desiring to spend more time on the property and to immerse themselves in their own creative pursuits Rick and JoAnn shifted their attention toward the untapped potential still left in The Martyn House. While in India for a merchandising photo shoot, JoAnn purchased a luxury-sleeping tent to serve as a guesthouse on the property. This was the catalyst for the reinvention of The Martyn House into a unique Bed and Breakfast; one where guests could embrace the peace and quiet of nature, while still enjoying all the comforts of home. The luxury sleeping tents provided a glamorous camping experience, where patrons slept in real beds with fine linens, and enjoyed gourmet meals. Today it is known as Glamping. The property soon offered rooms in their 1930’s Farmhouse, a converted barn became an Artist Studios, a workshop became a cottage and they added four luxury sleeping tents all part of the Bed and Breakfast. Often the entire property was reserved. Featured in Southern Living in 2010, and voted 1 of 88 best getaways in the US in 2012, The Martyn House was well on its way to sustainability. 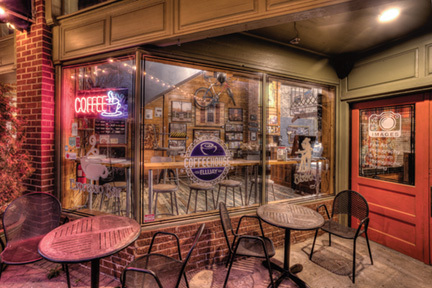 The Farm was the inspiration to create a community centric coffeehouse in 2012 when Rick and JoAnn made another bold move and purchased a 1940’s building in historic downtown Ellijay. They spent a year meticulously renovating the property, re-purposing old wood to give the building a warm, rustic nostalgic feeling. When the project was completed, the 5,800 sq. ft. building housed two lofts upstairs, a studio, an art gallery, and a unique coffeehouse unlike any local gathering place in Ellijay. Originally named The Martyn house In Towne today it is simply known as the Ellijay Coffeehouse. The coffeehouse and its unique design have made it anything but simple. There is a cozy lounge with a fireplace and leather sofas, which encourages people to settle in and enjoy visiting with friends or meeting a client. It has become known as the Local Living Room. It’s a specialty coffeehouse serving delicious coffee by the cup, by French press, aero press or pour overs and if you are new to the coffee culture their baristas are experts and can walk you through the world of coffee explaining many of the ways coffee can be served and you won’t want to miss their talent to make beautiful latte art designs. Their open kitchen serves Panini’s made with their own artisan bread & house made spreads served with their yummy pickles. Their quinoa salad is delicious as well as their soups. The pastries include scones and cookies. Be sure and try the parfaits made with their own granola. And on your way out you will definitely want to grab a bag of their beef jerky, a lb. of coffee, bag of granola or jar of pickles! The Coffeehouse is open 7AM- 7PM -7 days a week with two outdoor pet friendly courtyards and Free WIFI.